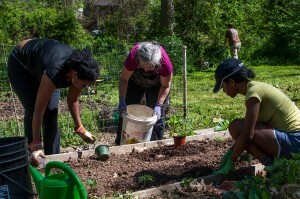 The Westview Community Garden recently experienced some turmoil after the leased land ended up in the hands of the FDIC. A handful of Westview community members swiftly joined forces to purchase the land, and to buy time for the Westview Community Organization to rally together and raise the funds to repay the loan. Various fundraising efforts are under way, including the art auction at Historic Fire Station 17, and the ongoing GoFundMe campaign efforts. Please consider making a donation to the GoFundMe campaign, however small or large, to help the Westview Community Organization reach its $10,000 goal! The Westview Community Garden is located at 1439 South Gordon Street. The common space is kept up by all gardeners through community work days. For 2014 the Westview Community Garden received a seed donation from the Herman’s Garden program at Seed Savers Exchange. The donation will allow the garden to grow an extensive variety of crops for the community and start a seed saving program that will provide for future years. Garden work days take place every Saturday from 10:00am to 2:00pm. If coordinator is not yet present please feel free to weed and harvest. Have questions? Would you like to get involved? Please contact Abbey Henderson at kadeyonnah79@gmail.com. To view photos of the Westview Community Garden also visit our Westview Facebook page. Help us raise the remaining funds!